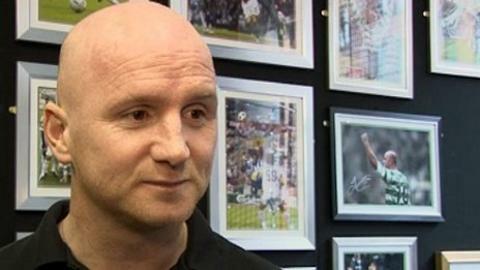 John Hartson says he wants to succeed Gary Speed as Wales manager. The former Wales striker had said he could not work with Wales assistant Raymond Verheijen and the current regime but later changed his view. Chris Coleman is favourite to replace Speed, who died in November, and Hartson has backed the former Fulham boss if he is overlooked. "I have a lot of support out there. I tick a lot of the boxes," said Hartson, who has no managerial experience. Both Coleman and Hartson were interviewed for the Wales managerial post in 2010 but the former Wales captains were beaten to the job by Speed, another former Wales skipper. Verheijen has said he and fellow assistant Osian Roberts want to be involved in a new regime, warning the Football Association of Wales it would be "turning their back on Speed" if it opted to bring in a different managerial team. Premier League champions Manchester United have turned down the Welsh FA's request to talk to former Wales captain Ryan Giggs about succeeding Speed, , while Wales' record goal-scorer Ian Rush has also been linked to the vacancy. Hartson has completed his Uefa Pro licence coaching badges but rejected the chance to succeed Gordon Wylde as East Stirlingshire manager in 2008. In 2011, he helped coach non-league Newport County's strikers. And the former Celtic, West Ham and Arsenal striker has admitted he has not formally applied for the job, stating the FAW "know my details." "I was interviewed last year and I was told I interviewed well and made a big impression," said Hartson. "In terms of the experience, Chris Coleman is way ahead. He has managed in three different countries, Fulham in England, Spain, and he's just come back from Greece." Coleman, who resigned as manager of Greek side Larissa this week, is a free to take over the Wales job immediately and has indicated he would be willing to work with the present backroom staff. Hartson had said he had no interest in teaming up with Verheijen, whose Wales contract runs until 2014, but later did a U-turn. "It would be very difficult for any manager going in knowing that the number two, who is your biggest and trusted ally, potentially wants your job," said Hartson. "I don't think I'm in a position to call shots here as it will be my first job and I would be honoured to do it. "I actually called Raymond a disgrace which I take back. "I don't think it would be an issue to go in as a leading man and absolutely I would work with the current regime if it meant me leading my country." Wales won four of their last five internationals before Speed's shock death in November and in the Fifa rankings in 2011 as they moved to 48th place from 113th in the world. No discussions have taken place with any potential candidates, according to the FAW, and chief executive Jonathan Ford has said it is "too early" to say whether an appointment will be made before their next friendly with Costa Rica in Cardiff on 29 February. But Stoke City's Welsh manager Tony Pulis has admitted he would consider managing Wales for that memorial match for Speed against Costa Rica. "I've no burning ambition at this present moment to be the manager of the Welsh national team," Pulis said. "But If Gary's family asked me, I wouldn't say no to that."